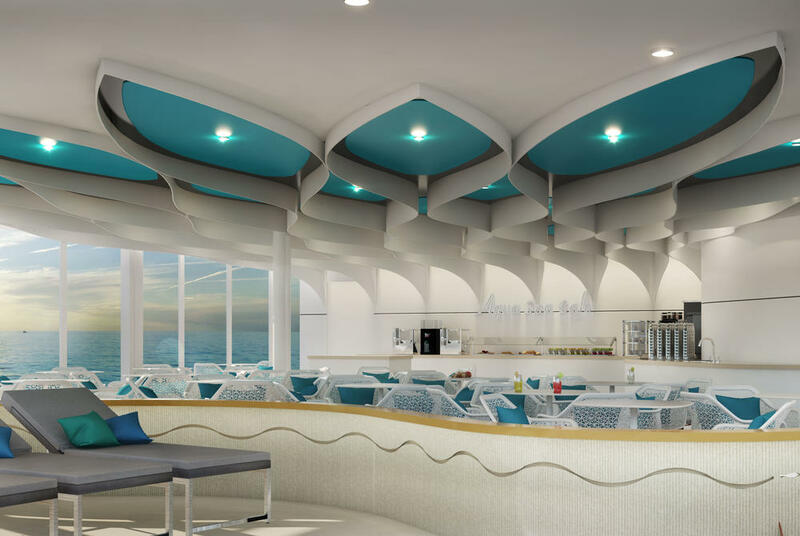 Celebrity Cruises has announced new dining concepts for its latest cruise ship Celebrity Edge. Italian inspired main restaurant, offering flavours one would find in southern Italian eateries. The Tuscan will feature modern classical design inspired by Italian fashion and film, and is a nod to Celebrity’s much-loved Tuscan Grille. Mediterranean inspired main restaurant, featuring simple and clean flavours from this region. This stunning venue has been designed by world-renowned designer, Patricia Urquiola. Main restaurant showcasing contemporary French cuisine in a modern and upscale setting. In a nod to nostalgia, Normandie will feature wood panels from the original SS Normandie restaurant that featured on-board Celebrity Summit. 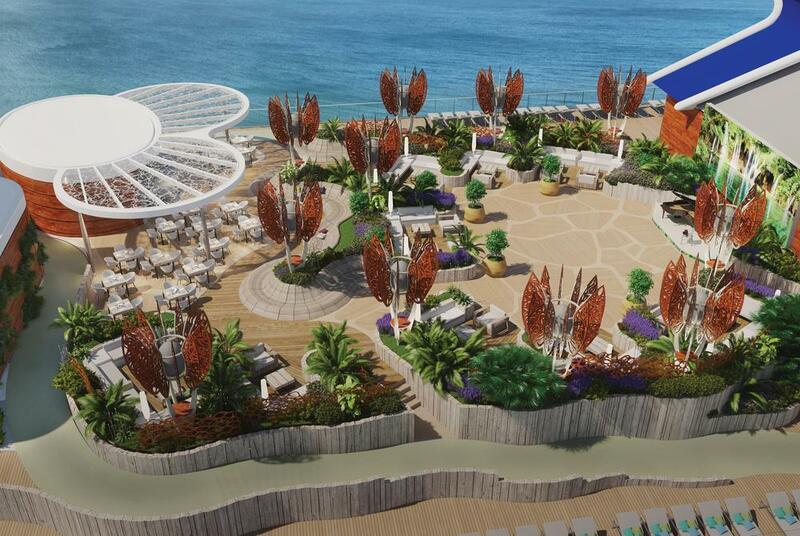 The next evolution of Celebrity Cruises traditional main restaurants. The walkthrough wine display at the entrance sets the scene for the cuisine to be enjoyed here – new American with international influences. Together, the main dining menus offer Celebrity Cruises largest selection of dishes ever, plus regionally inspired wines, cocktails and dishes that are served nowhere else on board. With Celebrity Traditional Dining, guests choose early or late seating, which allows them to enjoy dinner at the same table with the same waiter every evening. With this option, they will be assigned to one of the four main restaurants, while having the ability to experience the others upon request. Celebrity Select Dining Plus allows guests to dine when and where they’d like to each evening; they can make reservations in any of the four restaurants at the time they wish. The highest rated restaurant fleet wide and exclusive for Suite Class guests, designed by visionary designer Kelly Hoppen. Features a menu which changes daily and an award-winning wine list. AquaClass® exclusive. Clean, crisp and inventive cuisine accompanied by a wine list of biodynamic and sustainable wines meet personalised and genuine service. Fine Cut Steakhouse delivers dinner with impeccable service, outstanding views and stunning al fresco seaside-dining on a private, hedge-lined terrace that looks out over the sea offering premium cuts cooked to guests’ preferences. There will be a $55 per person cover charge to dine at the Fine Cut Steakhouse. Inspired by classic French bistros, Le Grand Bistro excites guests with the mouthwatering sights, scents, and sounds designed to transport guests to a bistro in the heart of Paris with handmade macaroons, artisanal cheeses and freshly baked bread available on-the-go. There will be a $10 per person cover charge for breakfast, $20 per person for lunch and $25 per person for dinner at Le Grand Bistro. 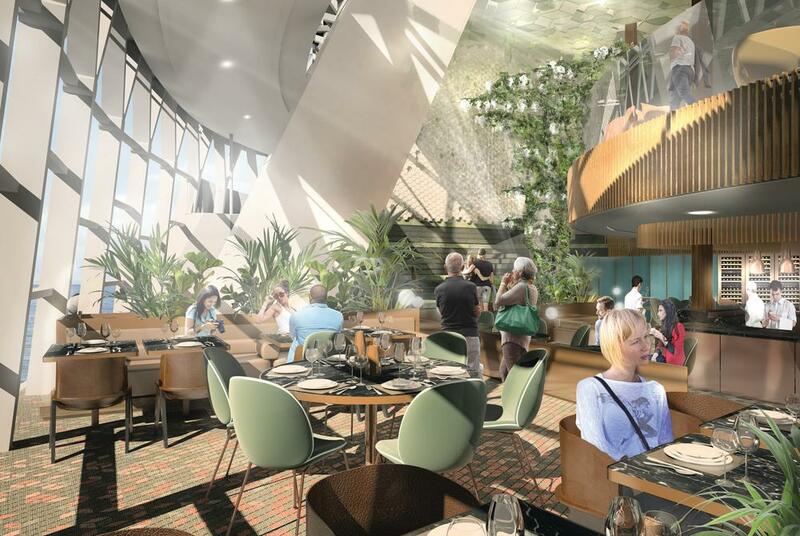 The Rooftop Garden Grill is a lively, spacious environment at the top of the ship that’s perfect for slowing down and satisfying your cravings for mouthwatering backyard BBQ favourites. There will be a $25 per person cover charge to have lunch and a $45 per person charge for dinner at the Rooftop Garden Grill. As the Magic Carpet makes its way up the side of the ship, it reaches the very top level which becomes Dinner on the Edge – an extraordinary, exhilarating sky-high al fresco dining experience. Using innovative technology created by Skullmapping and presented by TableMation Studios, Celebrity Cruises are bringing the tabletop to life with Le Petit Chef - an animated character who appears beside your plate and prepares each course you’ll be enjoying right in front of you before you’re served the actual dish It’s an immersive, mind-blowing fusion of entertainment and dining like nothing you’ve experienced before. Le Petit Chef will be featured evenings in Le Grand Bistro. There will be a $55 per person cover charge to dine at Le Petit Chef. Dinner at Eden Restaurant isn’t a meal – it’s a unique, personal culinary journey that transports you through Eden itself. Once seated, your Edenists will serve a choreographed series of culinary temptations that will not only thrill your taste buds, but every other sense as well. There will be a $65 per person cover charge to dine at Eden for dinner. 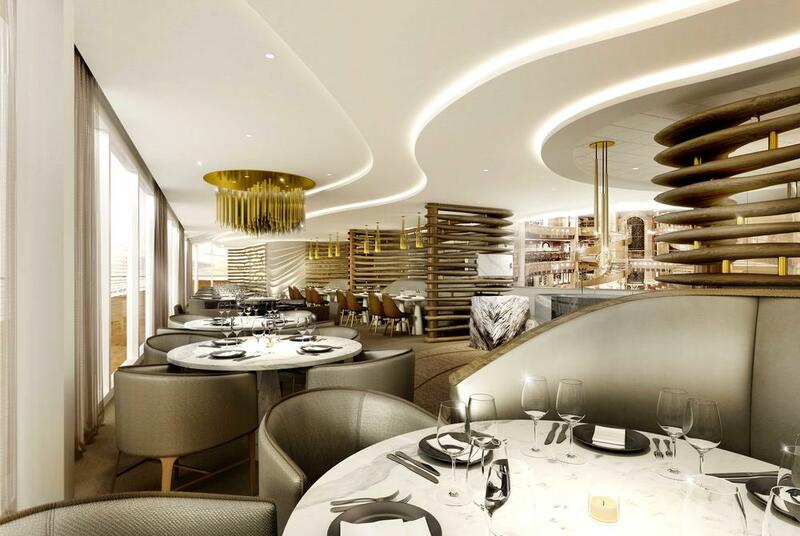 Popular venues such as Café al Bacio, and the Martini Bar will also feature onboard Celebrity Edge. The Oceanview cafe will include new live-action stations, a new bakery, and more two-storey floor to ceiling windows than ever before. A new complimentary venue, the Grand Plaza Café promises to be a popular addition and guests can choose from a café, bar and restaurant within Eden Cafe. Step outside and grab a burger in a relaxed poolside environment at the Mast Grill. If you're looking for something new, try a creative take on healthy fare at the Spa Café & Juice Bar.